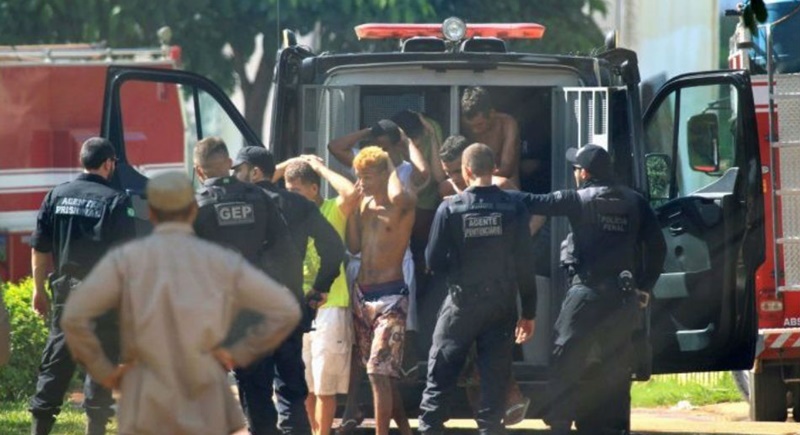 BRAZIL: Nearly a hundred escaped inmates remained at large from a state prison in Brazil yesterday (Jan 2) after a deadly riot between rival gangs left nine prisoners dead, all of them burned and two decapitated, officials said. The riot occurred on Monday (Jan 1) in the Complejo de Aparecida prison in the centre-west state of Goias. Another 14 inmates were wounded, one of them critically, the head of the state’s prison service, Lt Col Newton Castilho, told a news conference. The violence broke out in a semi-open part of the prison when “C-Block invaded the other wings and started brutal acts against their rivals,” he said. “There were wounded, bodies burned, and two decapitations,” he said, adding that inmates set fire to a cell block. The cause of the confrontation appeared to be “splits in the drug-trafficking crime world,” Castilho said. The violent episode recalled a prison riot a year earlier in Manaus, in Brazil’s Amazon region, which left 56 dead. The country’s prisons often see confrontations between the two main criminal gangs, the Sao Paulo-based PCC and the Comando Vermelho from Rio de Janeiro, and their offshoots. Clashes claimed more than 100 lives last year. Brazil has the world’s third largest prison population. Official data from June 2016 showed there were more than 700,000 inmates – more than double the capacity built to hold them.